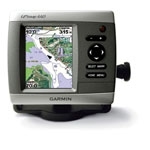 I have a beautiful Garmin 440s GPS unit that faithfully takes me out and brings me back to home port. But one day, like all electronic equipment, it will stop working. So, in addition to carrying charts and a compasss on board, I also have a small, hand-held Garmin GPSMAP 60CSx. You don't have to have one that fancy but I recieved mine as a retirement gift. They are so in-expensive these days that it is almost silly not to have a backup. 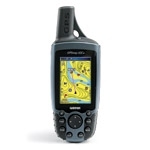 The Garmin GPSMAP 60CSx will run on 2 AA batteries or plug into a 12V Aux Port.